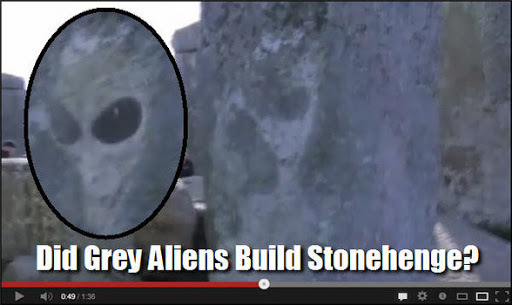 A video on YouTube claims to have found evidence, etched in stone, that “Grey Aliens” either built Stonehenge, or influenced its makers. Can it be true?The video, posted to YouTube on Feb. 21, seems like any of thousands of videos taken by tourists visiting the legendary, iconic and ancient monument. In it, people are milling around the site and this visitor is videotaping while touring it. 4000 year old Alien Grey carving surfaces at the Ancient site of Stonehenge in England during stone surface testing. This is an AUTHENTIC CARVING in the surface of the stone and has been RADIO CARBON 14 DATED to be over 4000 years old. This is NOT a stain or overgrowth. This is an AUTHENTIC stone carving, etched out by Ancient Man.